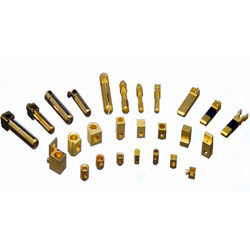 Our specialization in this discipline enables us to offer the best range of Electrical & Socket Pins. Fabricated using brass and required basic material, these products conform to the industry laid quality parameters. These offered pins are available with us in different sizes and designs suited to the divergent demands of the clients. Coating : Natural, Nickel, Tin, Chrome, Silver or any coating as per customer specification.